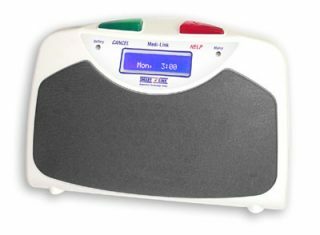 Medi-Diallers represent the latest in telephone-based emergency call systems. These units simply plug into any existing telephone, instantly taking care of any emergency or monitoring situation required. Whether the emergency be medical, fire, security or any type of urgent situation, an automatic response is catered for. A user can also simply push a button worn or carried (wrist watch, necklace or keyring) which summons immediate help through external or on-site monitoring/paging facilities. It’s like having a full-time carer that never sleeps. 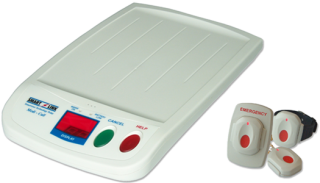 Medi-Diallers are activated by simply pressing a button, either on the units themselves or via a radio-frequency transmitter. These transmitters can be attached to a key-ring (FOB type), worn around around the neck (pendant type) or on the wrist using a wristwatch strap (watch type). This flexibility allows the user to be comfortable and confident in their ability to control any situation and instantly summon assistance 24 hours a day. Medi-Diallers are very simple to install, requiring a plug-pack power adapter or UPS for operation even in the event of mains power failure. The telephone plugs into the dialler unit, programme the telephones number or numbers to be called in an emergency and away you go. The majority of installations are that simple! Medi-Diallers can be programmed to call land-lines or mobile phones, even '000' to contact Emergency Services! These features are easily accessible for customising the system to suit each individual's requirements. Designed to provide the user with the ultimate in protection, reliability and peace of mind, Medi-Diallers can be programmed to summon assistance by transmitting messages via the telephone line to a Central Monitoring Station (addiitonal charges may apply for this service). Notification of the need of assistance is only a button press away. Many units will automatically answer incoming calls hands-free after an alarm has been sent. This feature is designed to provide immediate voice communication to the called party, automatically providing the user with confidence that help is on it's way. This feature also allows the carer or operator to immediately gain valuable information that will assist in making fast, correct decisions that may make all the difference! There is also a facility allowing you to answer the telephone without physically lifting the handset in hands-free mode from your wristwatch radio transmitter. So give Comtel Technologies a call or send an email enquiry to find out more about Medi-Diallers and the peace of mind they provide.